Sometimes the food fads happen so quickly I don’t even know a food is out and then I hear it’s in again. That’s what happened recently when I heard that cauliflower is the new kale. Didn’t cauliflower have to be out before it became the new kale? It’s questions like this that keep me awake and watching Law & Order reruns at 2 a.m. When kale became an in food, I’d only seen it at the farmer’s market and really didn’t know what to do with it other than I supposed stir fry it. Then I had an amazing kale salad at a New York restaurant and before I knew it I was living a cliché. For about two or three years, I thought my friends and I were so clever to be eating kale salads after lovingly massaging each leaf and then marinating them in lemon juice so that we could enjoy all the benefits of a (very flavorful) superfood. Then one day, I discovered that Costco sells a pre-made raw chopped kale salad and, happy as I was, I knew that the fad was over. (I tried to link to this salad on line but they don’t sell it online. All I could think was “Good. More for me. Sorry. Not sorry). I love my kale salad so much that I won’t let myself be bullied by the fact that it’s no longer chic, I’ll share the “recipe” such as it is but it’s actually not a recipe but more of an embarrassing admission: I buy bags of Costco’s Sweet Kale salad which has chopped kale, brussels sprouts, cabbage, and chicory. The package also includes Poppy Seed Dressing which I throw out because it’s the kind of mayonnaise-y concoction I can’t stand and would never use.The salad also comes with mixed pumpkin seeds and dried cranberries that I put aside for when I make tossed green salads for company. I like pumpkin seeds and craisins just not in my cabbagy lunch salad. Actually the folks at Trader Joes have just come with a version of the cruciferous salad that doesn’t come with dressing and seeds that mean you don’t have to throw anything out, and that works, too. Of course, if you go the Trader Joes route, you will need another source for your pumpkin seeds and craisins. Conveniently, dried fruit and seed mixes are just the sort of thing TJs has always sold. I suppose some clever readers will tell me that it is also possible to just buy some cruciferous vegetables and chop them; that is true but then it wouldn’t be my simple, one-person-quick-lunch-thrown-together-at-home. And by the way, this is not the recipe part of this blog post. This is glimpse into my life part of this blog post. Anyway, back to lunch. I add fresh pomegranate seeds, salted peanuts and (in my case vegetarian) fish sauce. Voila, a salty/sweet, fiber-filled lunch for one. It satisfies cravings , fills me, and, in case you’re counting, is not a lot of Weight Watchers points. (Yup, total honesty here: I devised this lunch to meet my Weight Watchers needs and to consume as few points as possible before dinner time. But I really, really like and managed to crave it for more days in a row than you can imagine). Now that we’ve got all that out of the way, we’ve come to the recipe part of the blog post. The recipe I really wanted to focus on in this blog post does not have that now passé superfood kale and instead has the newly avant garde member of the cabbage family: my beloved cauliflower, appearing here in a gingery Indian soup. Since I started working mostly at home not only do I eat my out-of-date kale salad for lunch, I’ve also become much better about checking the inventory in the fridge and using up leftovers. Once upon a time, we wasted leftovers here. Mr. Dot (who generally does the cleaning up) would want to throw things away and I would try to convince him that I really would use them. In the old days, before I was a consultant, we’d find stuff in tupperware weeks later and it did not look too appetizing. Now that I’m around and spend a lot less time commuting, I’m much better at planning our meals to use up leftovers while at the same time repurposing the food so that we don’t feel like we’re always eating the same thing. 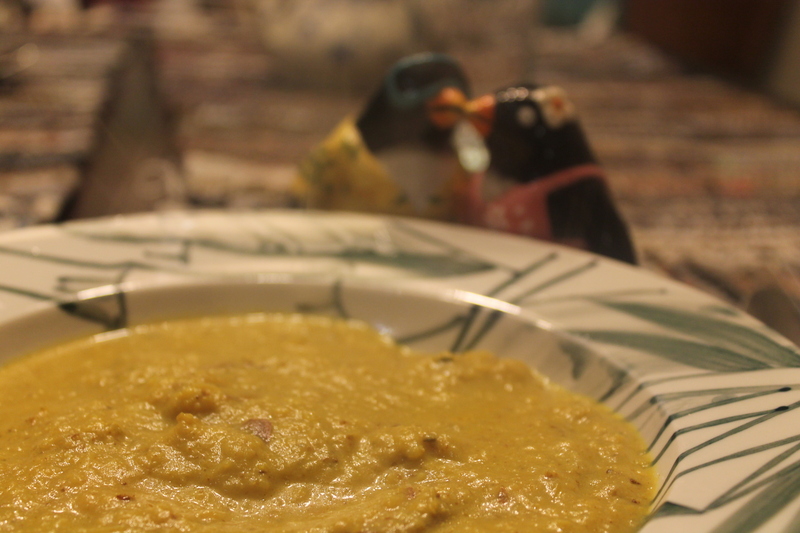 One of my favorite ways to use leftovers is this cauliflower soup, an adaptation of an Indian recipe. I start out with cauliflower, which, chez Dot, has usually been roasted for a previous meal (though it could also be steamed or boiled and the soup would still be great). This, like other Indian dishes of mine, cooks up pretty quickly but has a lot of flavor thanks to all the spices. Set the oil in a medium high heat in a good size saucepan. When the oil is hot, put in leek, ginger and garlic. Stir and fry for about 4 minutes or until onion is somewhat browned. Put in cumin, coriander, turmeric and cayenne pepper. Stir once and put in potatoes and stock. Stir and bring to a boil. Cover, turn the hit to low and simmer gently for 10 minutes until potatoes are tender. Add cauliflower and cook for a few more minutes. Taste for salt and add as necessary. Blend with immersion blender or add to blender in two batches. I like this with some lumps. This does not have to be a thin soup. Add cream and reheat and serve.